1 – Clean and organize your kitchen. Regardless of how old or new your kitchen is, that pile of dirty dishes sitting in the sink is not inspiring or cheery. Moreover, years of accumulated recipe scribbles, cookbooks, broken utensils and other kitchen paraphernalia needs an occasional sort-through to ensure that you only use the best, most reliable tools and that you’re finding your favorite recipes with ease. Declutter. Unnecessary items on counter-tops, tables, and so forth can cause kitchens to feel “heavy” and less cheerful. Get unnecessary appliances off of the counters. The rule tends to be to have only one or two small appliances out. Usually these will be ones used every day, or ones that are two big or impractical to store. Toasters should not be stored in cabinets, as they tend to be full of crumbs. Coffee makers such as cappuccino makers are usually too big. Items used once a week, such as waffle irons should be stored out of sight. 2 – Brighten up the room. Add or replace light fixtures, open the blinds, and consider installing a skylight, if you have that option. Light in the kitchen lets you see what you are doing and also brightens up the room. You may even find yourself inspired to tidy up more often. Consider having specific spotlights installed over workspace areas. It is easier to see, especially when cutting, carving and chopping food, under a bright, direct light. Additional light also brightens up the kitchen space. 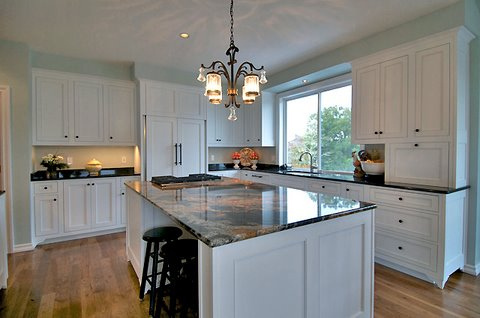 Under-cabinet lights are especially good at adding additional light. Some do not require wiring and run on batteries. During winter, a more brightly lit kitchen will help maintain everyone’s cheeriness. 3 – Bring in color. 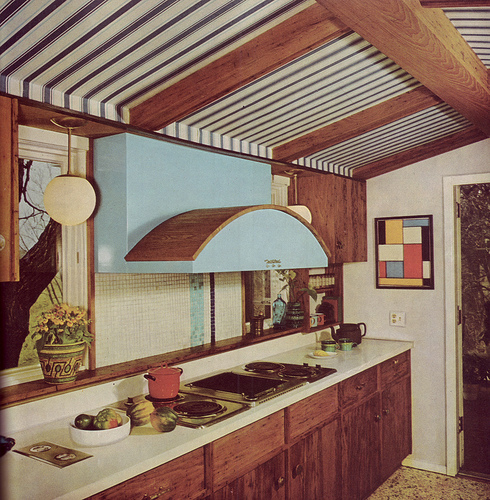 Consider the color of your cabinets. 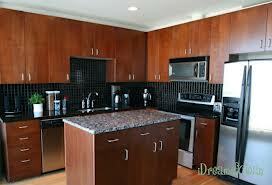 Cabinets are often the main color of your kitchen. If your cabinets are very dark, this tends to make a kitchen feel less cheerful. White tends to brighten and lighten. Replace flooring. A worn-out kitchen floor makes a kitchen look tired. Paint walls. Sometimes just a fresh coat of paint will do wonders. Traditionally, lighter colors are used in kitchens to keep it light and cheerful. Wash the walls and cabinets. 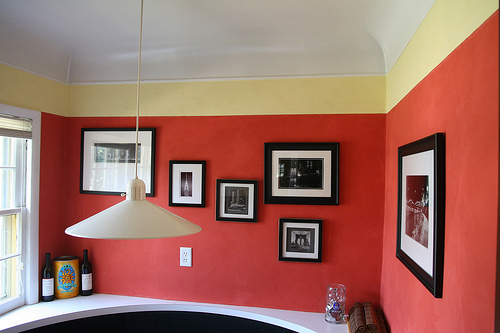 Sometimes painting is not an option, such as in a rental or a mobile home. Kitchen walls are subjected to subtle stains from cooking even if a kitchen is kept clean. A deep cleaning with a cleaner such as TSP can significantly improve the appearance of the kitchen and you may decide you do not need to paint after all. Choose colors you like, whether or not they are fashionable this year. What cheers up one person may not work for another. Gray, for instance, may sound dull and depressing but the right gray can look sophisticated and chic. 4 – Incorporate decorative objects. A few inspiring pieces can bring personality into the “heart of the home”. Some common items include: tea towels, pot holders, refrigerator magnets, curtains, and any other decorative item that strikes your fancy; this is your space! It can be pleasurable to follow a theme: red and white, 1950’s, flowers, and so on. Be careful that decorative items do not cross over into becoming clutter. Remember that decorating is as much about what you choose not to keep in your kitchen as what you do. One or two focal items are probably plenty. Keep decorative items away from work surfaces and places they will get in the way, become soiled, or broken. For instance, counter-tops should be almost exclusively work surfaces, and not where you should display your Depression-era glassware. Try to use decorative items that are easy to clean. Your collection of vintage plates, for instance, are easy to wash should they become dusty, greasy, or otherwise dirty. 5 – Use foods as decorative elements. Fruits and vegetables. Choose a variety of colorful, seasonal vegetables and display them in a bowl or basket on your counter. A bowl of Granny Smith apples, for instance, is often featured on tables of kitchen catalogs. Prominently displaying fruits and vegetables may also encourage consuming them. Beans, grains, and colored pasta. Store a few in clear glass jars on the counter or on an open shelf. These can lend an inexpensive decorative air while being useful. Preserved items in glass jars. 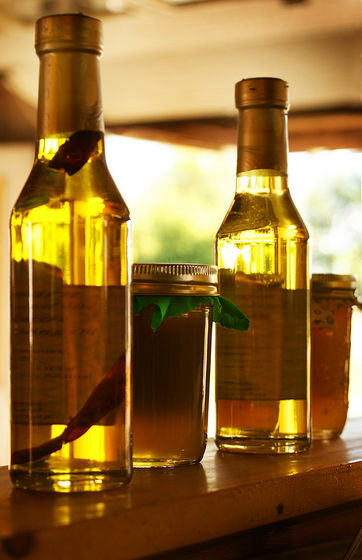 From homemade jam or pickles to fancy herb vinegars and oils, there are lots to choose from. If you intend to eat these items, be sure to use them within the use-by date and rotate in new ones regularly. Also, keep them out of direct sunlight and away from heat. 6- Use kitchen tools and utensils as decorative elements. Hang a pot rack, use a utensil jar, or put colorful tableware behind glass cabinet doors where it can be seen. All these things make the kitchen look lived in, and may encourage you to live in it more. Copper is a favorite for making a kitchen cheerier, as it’s bright, reflective and elegant. Choose pans, kettle and other items made from copper and arrange them decoratively. Copper items are expensive, so make a few pieces go a long way and check out secondhand stores for older copper pans. Keep in mind that copper pots have a tendency to tarnish. Avoid cookware clutter. 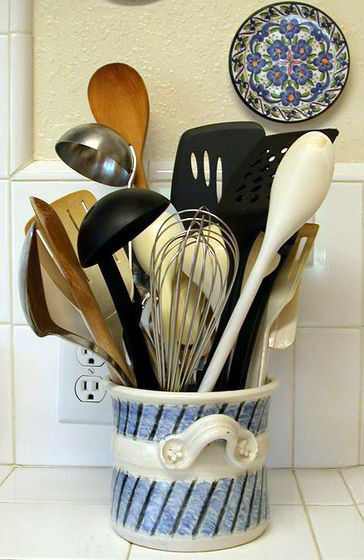 A common decorating mistake is having too many things out on a pot rack, or utensil jar. Less is usually more. Antique and vintage cooking utensils can be relatively inexpensive decorative kitchen items. These are usually relatively easy to find at estate sales, thrift stores, secondhand stores, and antique stores. Not all kitchens have naturally sunny windows, but it is possible to grow plants still, even under artificial light. A windowsill herb garden is a great addition to any kitchen. It will add color and scent to your kitchen and to your cooking. 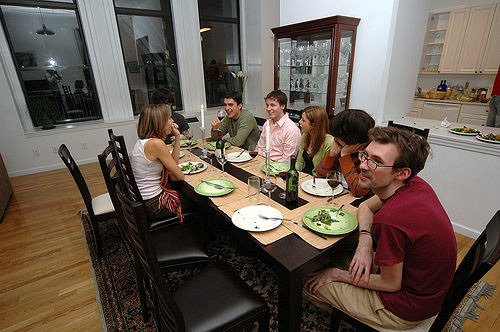 8 – Pay attention to seating and eating areas. 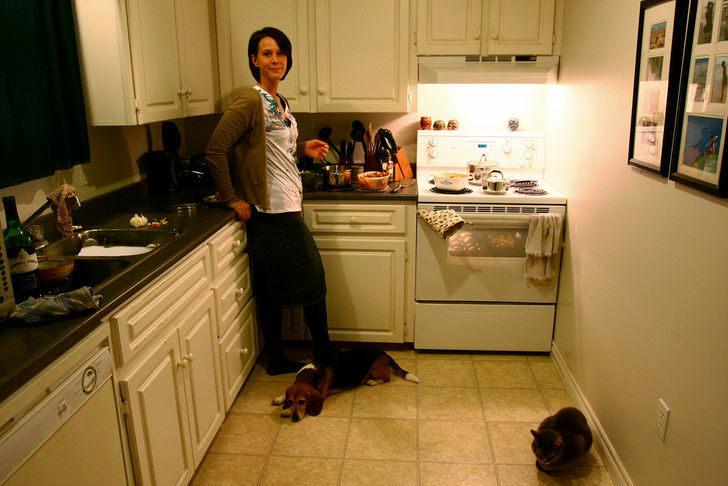 Many kitchens are not just for cooking. Instead, they feature bar seating, breakfast nooks, or the dining table itself. If you have such a spot in your kitchen, tidy it up, and include your chosen colors and styling elements there. You’ll learn a lot about food and cooking. You will enjoy the smells and tastes of foods. You will spend less money on food if you buy the ingredients and prepare them yourself. Nothing improves a room like great company.